I am a roboticist and a vision guy. I believe in working on projects that have applications in the real world. I am interested primarily in robotics (I like to do Computer Vision, Machine Learning, software engineering and some HCI too), I have worked with some robots - pioneer3AT, virtualMe, oculus prime robot, robotic team (12 rovers), maze solving robots, ball following robot, line followers. I am a very motivated and an excited soul craving for knowledge from all people I meet. Technology just excites me a lot. Click here to view my projects. To know more about my work shoot me an email - contact me. HIRE ME: If you are interested to hire me as a speaker, consultant, advisor, feel free to contact me ! I would be happy to talk more! WORK WITH ME: If you want to work with my on some research projects, feel free to send me about your background and projects you want to collaborate with. Contact me here. Students willing to work with me, please send me a copy of your CV. Brief Bio: Raghavender has expertise in the field of Applied AI & Robotics. He obtained his Masters in Computer Vision based Robotics from York University with his research on person following robots receiving multiple best paper awards and media attention (Discovery Channel, Globe and Mail, York University Magazine). He has been an AI Scientist in Residence for the 2018 NextAI cohort advising start-ups. 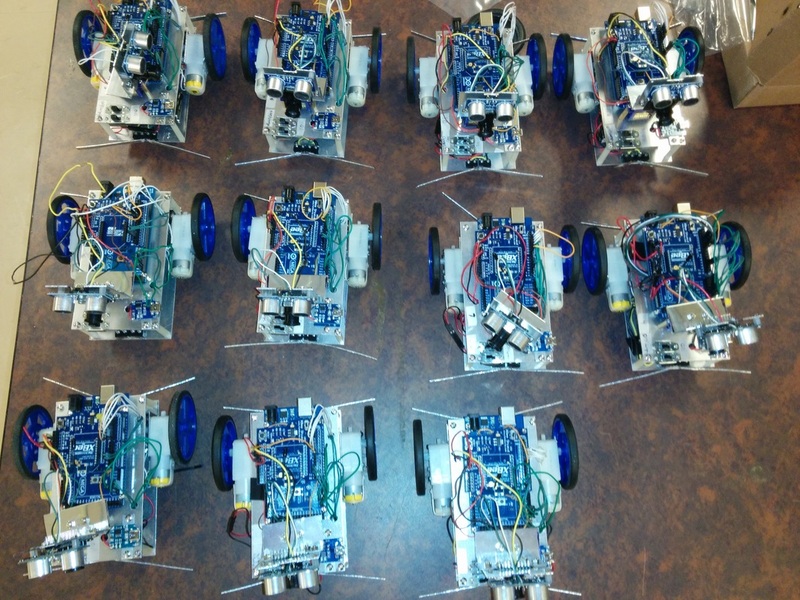 He has been a reviewer for the International Journal of Robotics Research (IJRR). He has contributed to open source projects like MRPT and OpenRobotics (OSRF) sponsored by Google. He’s been an active member of the NSERC Canadian Field Robotics Network since 2015 and has collaborated with organizations like University of Toronto, EPFL Switzerland, INCF Belgium. He is frequently attending research conferences worldwide to broaden his outreach and knowledge. Raghavender has upto 8 years of robotics experience. He has travelled (only for research and entrepreneurship) in over 20 cities in over 7 different countries (in the last 4-5 years) to know the scientific state of the art AI (Robotics, Computer Vision, Machine Learning) systems. Through his traveling and interactions with researchers, entrepreneurs, etc., he has gathered a vast amount of business as well as scientific knowledge and has a strong intuition about these AI systems. page last updated (October 2018): Life is enjoyably busy ! November 2018: My Google Summer of Code work on "Addition of support for Motion Planners in MoveIt" was published on the MoveIt blog here ! November 16, 2018: Invited speaker at the CREATE DAV bootcamp (at York University) to speak on my experience of working with start ups as an AI Scientist in Residence as a part of Next Canada (Next AI program). October 31, 2018: I am an invited speaker at the Vista Seminar series (as a part of Innovation York) to give a presentation on my experience as an AI Scientist in Residence for NEXT Canada. October, 2018: I was a reviewer for the 2018 International Journal on Robotics Research. October 4, 2018: I was on the panel for discussion at the IBM venture Labs, Markham as a part of an information session for NextAI. September 9-12, 2018: I attended the European Conference on Computer Vision (ECCV) in Munich, Germany as an exhibitor for NEXT Canada (NextAI program). August 22, 2018: I successfully finished the Google Summer of Code 2018 with OSRF (Open Source Robotics Foundation). July 23-27, 2018: I attended the 2nd Summer School on Cognitive Robotics at CSAIL (Computer Science Artificial Intelligence Laboratory), MIT (Massachusetts Institute of Technology) in Boston, Massachusetts, USA. July 14, 2018: I organized a trip to Niagara Falls for 37 interns (with 2 other mentors) from over 6-8 different countries as a mentor for the Mitacs Globalink Internship program. June 6-7, 2018: presented and attended the NSERC Canadian Field Robotics Network (NCFRN) in Montreal, Canada. May 21-25, 2018: Presented my paper on Scene Classification in indoor environments using context based word embeddings at International Conference on Robotics and Automation (ICRA 2018), at Brisbane, Australia. April 22, 2018: Got accepted to participate in Google Summer of Code 2018 for the organization Open Source Robotics Foundation (OSRF) to work on the project for "Addition of support for different motion planners in ROS-MoveIt". April 8-27 2018: I am on vacation (partly working). Relaxing in my country "BHARAT"! March, 2018: I started working as an AI Scientist in Residence for Next Canada's Next AI program. March 23, 2018: I successfully defended my Masters thesis and it got accepted without revisions and nominated for the Thesis Award. March 12, 2018: My Paper on localization in dynamic human environment got accepted at the 15th Conference on Computer and Robot Vision (CRV 2018), Toronto, May 9-11, 2018. October 19, 2017: I was interviewed earlier in June 2017 for an article on the kind of Robotics done at York University for Fall 2017 issue. Here is the complete published article. September 22, 2017: I presented a lightning talk (25:20 on-wards) at ROSCon 2017 on Person Following Robots. I am also attending IROS 2017 from September 24-28, 2017 in Vancouver. 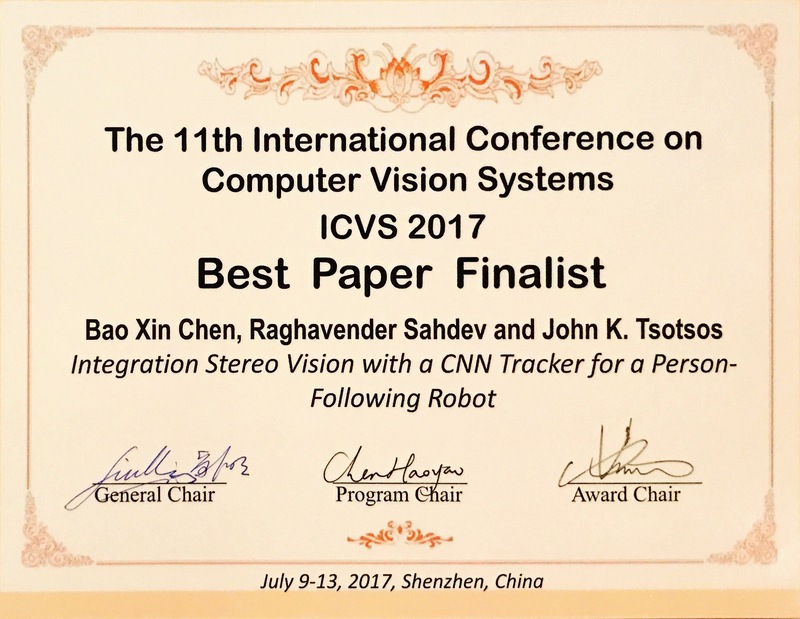 July 11, 2017: We were the Finalist for the Best Paper Award at ICVS 2017 (International Conference on Computer Vision Systems), Shenzhen, China for my work on Person Following robots using CNNs. June 14, 2017 : I presented my poster on Person Following Robots using Selected Online Ada-Boosting with a Stereo Camera in the International Conference on Computer Vision in the Real World at CVR (Centre for Vision Research), York University. May 17-19, 2017: Attended the Computer and Robot Vision Conference 2017 in Edmonton. We got the Best Robotics Paper Award at the Conference for my work on Person Following Robots. May 1-4, 2017: Attended the NCFRN Annual Field Trials in Ottawa, My work on Person following robots was covered by Discovery channel, globe and the mail media news. December 25-28, 2016: I was visiting MIT and Harvard informally with friends to gain some inspiration and motivation. October 17, 2016: My work on "Detecting the Magnitude of events from news articles" was presented at the International Conference on Web Intelligence, October, 2017. May 18, 2014: Started my Summer Research Internship sponsored by Mitacs at the University of Toronto, Toronto, Canada for 3 months. May 21, 2013: Started working as a Software Developer for the organization Atomic Energy Regulatory Board (AERB), Mumbai, India.